The 2014 Winter Olympics will soon be underway, as the best star athletes from all over the world represent their countries and descend into a sub-tropical land filled with complex tension, a widening gap between the rich and poor, regional uncertainty and fringe biases. From the anti-gay laws that rule the land in Sochi to the fear of terrorism that hangs like a cloud over the games, the glittering spectacle that is the Olympics are about to begin with a panicked flurry, and the lavish city is, seemingly, ready for the excess of it all. Photographer Rob Hornstra and journalist Arnold Van Bruggen spent the last five years of their lives documenting the trials, tribulations and heartbreak of the people that are also the makeup of the glimmering, sultry paradise that is Sochi, whose stories weren’t always known — not always told until now. Together, they created “The Sochi Project” as a way to showcase and archive the other side of the lush city — the one that, reportedly, had Russian authorities upset at the mere mention of the creation of this project. Harris talked about how he got involved with the “The Sochi Project,” the response to the art exhibit so far, why Sochi is more than just a tourist city and what he hopes people will learn from the project. A: So, Rob Hornstra and Arnold Van Bruggen funded their own project, and that’s how I first found out about it. … I was interested in Rob’s work as a photographer and had seen some of his earlier work, and this sounded like a really fascinating project. I was one of the original donors to the project, so that’s how I found out about it. Then, in fall 2012, they sent out an annual update email mentioning that they were planning an exhibition, and I shot them an email back, asking if they had plans to come to the U.S. … I said, “I work at a museum [DePaul Art]. Can we talk about the possibility of bringing it to Chicago?” and they were thrilled with that idea. … It was an opportunity to get the story out there and also for us to deal with these very relevant social and political issues around the Olympics and around Sochi. That’s something we like to do at the museum. Q: Given the anti-gay laws in Sochi coupled with the safety concerns for traveling athletes, how has the response to “The Sochi Project” been? A: So far, it’s been really positive. People really want to know more about Sochi and the North Caucasus. There’s all this attention around the Olympics, and until the Olympics were assigned, I don’t think people had any idea where Sochi was or what the area around Sochi was like. With the Olympics a week away, a lot of people are hearing more about it and kind of want to know this place. 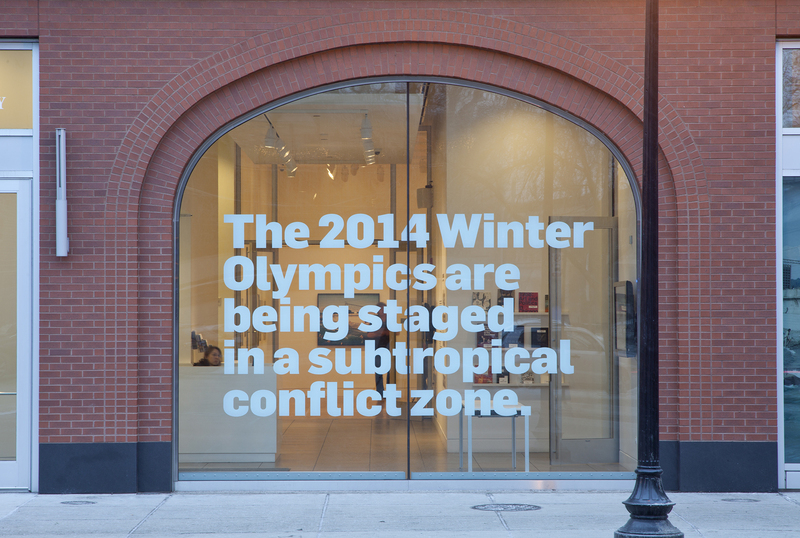 … This exhibition is not only about the Olympics … but it’s really much more about the bigger story of the North Caucasus. This exhibition really gets into the issues of … displacement of population, abject poverty and violent conflict. Q: What did you learn, personally, from curating the “The Sochi Project,” and what do you hope people will learn from the art exhibit? A: The really important takeaway is that this part of the world is a very diverse, a very rich place culturally and socially. It’s a fascinating place that really has not been getting a lot of in-depth attention, and so I’m hoping that people are really paying attention … that they’re thinking about how this event has been kind of plopped down in the middle of a lot of struggle. It’s created a lot of problems for people living in city of Sochi and that they’re thinking about how these events affect the lives of everyday people. “The Sochi Project” runs Jan. 9 – March 23 at the DePaul Art Museum on 935 W. Fullerton. Admission is free. ‹ How important is it for you to have a library and staff available at Roosevelt?